Growers who are buying weed seeds of the California Indica are, after the Orange Bud, clearly ready for the next step. They are able to take that step because the breeders at Sensi Seeds were also thinking a step ahead. An old-fashioned Afghan was used to add something extra to the Orange Bud. In terms of aroma this means that the plants from these cannabis seeds add some hash tones to the well-known citrus scent. Do not make the mistake of thinking that the Orange Bud (the “mother” of these cannabis seeds) can be assigned to a specific box. There are a large number of different types of Orange Bud on the market that can significantly differ in sativa-indica ratio. However, it is a fact that each Orange Bud lives up to its name in the sense that orange always is the dominating colour. The final end result of the California Indica weed seeds will also show this colour. What can also be derived from the name of these cannabis seeds, is the indica-dominance this plant embodies. Only 35 percent of the influence can be attributed to the sativa, the rest is indica. This combination is exactly enough to be able to grow a surprising combination whereby both the Afghan and the Californian will come well into their own. 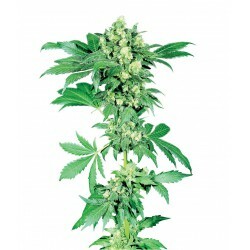 The grower who gets started with these weed seeds, will witness the flowering period after approximately 45 to 50 days. In a moderate climate the California Indica will perfectly reach its full potential and the result is a harvest of enormous proportions. The physical sensations you experience during smoking are the result of the Afghan influences while the typical Californian high is also never far away. The tastebuds of the smoker will detect resin as a result of which the California Indica can sometimes feel (pleasantly) bitter. Yet, the citrus taste of this plant will dominate and that is the way it should be: nothing else may actually be expected from a type that is based on the California Orange Bud.